Many of today’s retail and marketing executives feel like the proverbial dinosaur when it comes to their industry. Business for them was uncomplicated before the digital age—at least that is the general consensus. Many saw success as simply a degree of customer service and smart real estate decisions. Now, with changing technology, the Trojan horse is welcomed into stores. Immediate gratification, speed to market, seamless merchandising, frictionless transactions and rapid returns have taken on new meaning. Yet, while retail and marketing executives struggling to reinvent a timeless industry once again, one must stay current so as to not get lost in the transition. Whether someone is a sales associate working in retail or an executive trying to sort out the current state of commercialism, tips to get through a technology transition seamlessly are priceless. 1. Maximize customer base above all else. Many companies focus on new customer acquisition and manage current and repeat customers as a secondary priority. However, the likelihood of selling to a current base is a minimum of 40 percentage points greater than selling to non-customers, yet only $1 out of every $92 is spent on increasing conversion. This means businesses spend a fraction of their available budgets on their actual consumers. A business is like a portfolio of investments—put money where the greatest return can be achieved. 2. Don’t treat every stage of the purchase funnel the same. Focus on high intent. The traditional marketing pyramid has developed to encompass a variety of models, from a larger opening at the top to attract the greatest number of prospects, to the fine point being inverted to focus on the influential few. Which is the best model? Actually, the middle section is most important. Focusing time and resources on the “consideration” segment is the most lucrative option. Spend less time finding new people and “driving” them to the website or store and spend more time on the people who have already arrived. Target ways to get the “consideration” segment from the “front door” to a specific department and then to purchase. 3. Create a frictionless checkout. Sixty-seven percent of cart abandonments are due to payment issues. Take a lesson from Amazon. Tests show an Amazon “Option to Buy” elevates sales and lowers cost per order. This convenience is appreciated by the 90 million Amazon Prime customers because it makes ordering easy. When a customer has to enter credit card and shipping information on a website, she is more inclined not to make that purchase. Amazon stores a customer’s information so a purchase can be made with one click. Many businesses are following suit using PayPal, iPay or new Visa programs. The easiest and most secure method of payment ensures the likelihood of a customer making a purchase. 4. Think mobile first in design and advertising. Video is king, growing from $8.7 billion to a projected $25.7 billion by 2019. People consume content with images and moving images. The most successful formats are the 15 second vide due to the fact that most customers have limited time, attention spans vary and social platforms are fast reads. Look for new developments in vertical video (format shifted from horizontal to full screen vertical) and 360 video (panoramic virtual view). The key to social marketing and video content is to leverage “end cards”. These prompts displayed at the end of a video can be “call to action screens” or “clickable buttons”. The “end cards” elicit a means to a sale so that the video is not solely entertaining; the purpose is to inform and sell. Also, best practices include using five megabytes or less, limiting trackers to two (they slow the loading process) and utilizing MP4 files. The goal in thinking mobile and taking advantage of videos to sell merchandise is to keep content simple and fast. 5. Invest in near frequency/location based technology now. Perhaps the Apple Watch did not take the country by storm, but mobile integrated technology, such as smart fabrics and accessories, and the “attached-at-the hip” use of cell phones are making geo-targeted (geographically-targeted) marketing a must. Sending messages and advertisements to potential customers based on their habits, behavior and distance or proximity to your business will become more commonplace in the very near future. 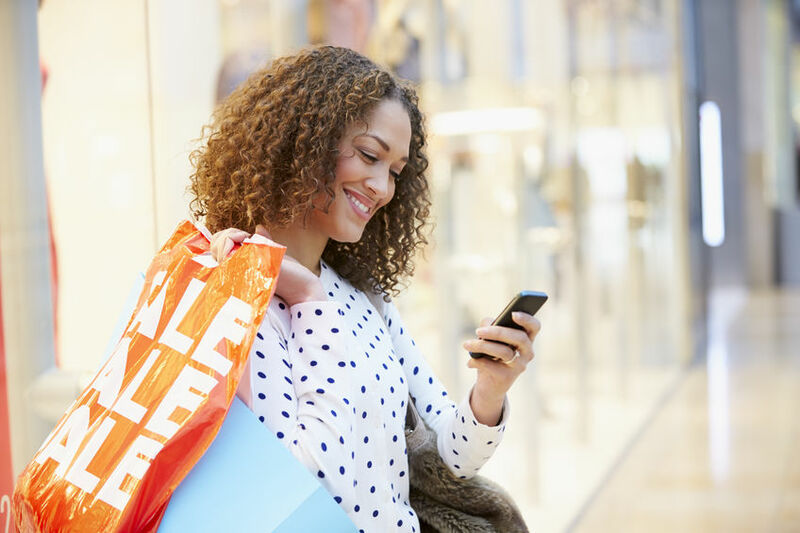 Start by being one of the first to attract the savvy and technologically informed shopper to your storefront or website by utilizing new mobile-integrated technology. Smart executives need to determine what type of communication is triggering a desired behavior and which combination of messages will yield the greatest return. It is vital that a company’s team has an expert analyst who can manage test or control segments and isolate triggers so that monies can be spent accordingly. 7. Get on the App bandwagon. In App (short for application) advertising, 9o% of mobile is consumed in App, which is downloaded content and interactions that work independently of traditional search feeds. For example, instead of going through a search engine like Google and gaining access to a company, brand, or store via a website, one can opt to add a specific Application to be featured on your home screen so access to a company, brand or store is immediate and direct. The fact that the average number of Apps used by Smartphone owner is 27, shows the popularity of this type of marketing. Some specific examples are Dunkin Donuts Rewards, Facebook, and Sephora. Other common Apps are Weather, Sports, and Tip Calculators. Apps have gone through love- hate status by marketers but presently are in the “just join them as we can’t beat them” phase. The good news is that consumers love Apps and use them because of their convenience. The bad news is that Apps evade search engine and site optimization efforts, so the only way to get to customers who use Apps over search engines is to include Application advertising to your media mix. 8. Protect your brand from becoming a marketplace item. It is crucial to invest for long term value. Keep an eye on Alibaba, China’s bigger and more encompassing version of Amazon. Alibaba is an auction, marketplace, search engine, social platform and payment system all in one. Understanding the concept of a marketplace is important whether using a global platform or trying to survive in the age of Amazon in the United States. A marketplace is a buyer’s heaven; it lists searched products and closely related searches according to price and service levels, not discriminating against big and small companies or branded versus non branded companies. For example, a company selling a particular brand of polo shirts is in competition with any wholesale or affiliate accounts on Amazon and may have lower pricing. Many brands have succumbed to adding products to Amazon just to get their piece of the 90 million person pie. The risk is that they have now entered a commodity market, making their products differentiated solely by price and listing rank, therefore being subject to counterfeiters. Finding means to enhance one’s brand, company or business by providing an experience exclusive and special enough that customers have a penchant for it. There are customers who only want to buy sneakers from Nike.com and will not look for them anywhere else. 9. Reinvent your retail store now. A retail store should begin as a unique brand experience and evolve into an ecosystem. Whether marketing a brand, retailer or service company, evaluation and research regarding how customers engage and evolve the business model must be completed to anticipate customers’ future needs and desires. In light of the challenges many department stores are going through now, every company will need to assess their business model. A great example of a vision for the future is Peloton. Yes, they sell spinning equipment, but they are in actuality selling access to their ecosystem, live global fitness instruction and overall community. Saturn, a car company no longer in existence, actually entered this world of community first. Customers bought the Saturn community first, and the car came with it. Tesla, a premium electric SUV’s and sedans company, is part of the retail showrooming phase as well. New models are also emerging in the culinary and subscription arenas, such as Blue Apron and Bark Box and Dollar Shave Club. Don’t be left behind, look for ways to thrive long-term by shifting your paradigm short-term. 10. Don’t dismiss innovation and brand investment as useless. Innovation and brand investment are the only things that can truly differentiate your company in the marketplace. There are countless stories of companies dismissing brand spend as excess—being the first budget to be cut and the last to reinstate. The truth is companies that protect their brand during bad times actually emerge through recoveries at faster and more productive rates. It is like buying good stocks when they are down rather than selling off at the first sign of caution. The investment will develop your equity levels to new heights and catapult your success for the future. One CEO of a leading and enormously successful fashion house said that he was not in the business of taking shortcuts in the name of making some money now; he said that he was a very patient man and was willing to wait to nurture and grow and evolve the brand for sustaining the company to achieve much longer and greater returns. Why go on a crash diet when you can be fit for life? With constant changes in technology and marketing, chances are the industry has already shifted at this point in time! However, getting one’s business mind in shape and keeping it in shape, results in easier transitions from one technology trend to another. After all, being successful today is not a race, it’s a marathon.